For a live theatre event that the whole family will enjoy, look no further than David Ben’s Hocus Pocus. Large-scale magic may be spectacular, but it is the small-scale magic that Ben practices that really amazes because the audience is so close to the action. The Michael Young Theatre at the Young Centre seats only 207 people and the sheer proximity of view to magician increases the impact of every magical effect since we can see for ourselves that there are no wire, strings or other mechanisms to aid the performer. And David Ben, as anyone who has followed his career will know, is a highly engaging performer. 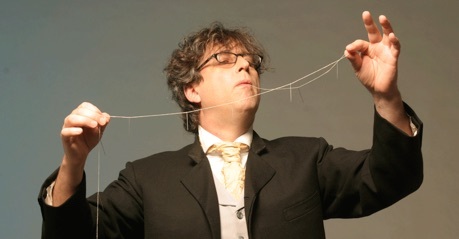 Rather than the braggadocio or self-aggrandizement of some stage magicians, Ben’s bookish, low-key approach creates the unintimidating atmosphere of a performer sharing some of his talents with a group of friends. Because Ben’s style is so understated, the effects he produces seem all the more surprising. Of Ben’s previous shows, Hocus Pocus is most like The Conjuror Suite (1999), where Ben recreated the atmosphere of a early 20th-century salon. Since Hocus Pocus is meant for families, the historical pretence is gone, but the feeling of intimacy remains. Anyone who has been a fan of Ben for long, will have seen all of the tricks in this show before at one time or another. The show begins as did Natural Magick (2011) with a silent newsreel chronicling the dangers of bullet-catching including a necrology of magicians and their assistants who died performing this feat. It concluded with footage of a magician successfully performing the stunt in Fort Erie. Some may think that Ben has added bullet-catching to his routine, but fortunately this is not the case since you wouldn’t want children to get even the inkling of trying it at home. The film is so vague about what happens that most won’t understand it. But then why include it and why begin a live show with a film? Luckily, when Ben does appear he hits the audience with two super feats. The first is three audience-chosen cards rising one by one from a pack of cards in a wineglass – a beautiful and totally mystifying effect. The second is his only large-scale illusion known to magician’s as the Zig-Zag Girl. Ben places his lovely assistant, Julie Eng, in a sentry-like box. He then slides large metal blades into the front of the box and out the back thus dividing the box into thirds. With the help of an audience member he pushes the midsection of the box far to one side, seemingly displacing her torso, with the woman’s face, hands, and foot still visible and moving! Thus, with a small-scale and a large-scale illusion, Ben sets the tone of the world of the kind of non-high-tech magic that he so enjoys. From Natural Magick and earlier shows one will recall his masterful manipulation of the Chinese rings, the regurgitation of 20 needles swallowed separately but now strung on thread and the dangerous-looking passage of tied his securely tied thumbs back and forth through a samurai sword. Magic tricks of this kind the Ben stages them are rather like the moves in ballet. You never tire of seeing them because they are so well well performed. Ben also repeats two illusions he premiered in Natural Magick. One is an homage to a Peruvian magician known as “L’Homme masqué” in which a subject chosen from the audience somehow finds cards chosen by three audience members one after the other in the same pocket of his suit. The other finds Ben added handfuls of three colours of dry sand to a bowl of inky water and then taking the handfuls out again dry leaving nothing in the bowl! As one knows from both The Conjuror (1996) at the Shaw Festival and from The Conjuror Suite (1999) at the ROM, Ben is deeply intrigued by the history of magic and magicians. For this show, however, he radically cuts back on the historical anecdotes that used to introduce each illusion. A clever instance of this is in a pure sleight of hand trick involving six coins. He tells us how his grandfather as a boy met a man at Niagara Falls who began performing the trick of making six coins disappear and then reappear from wherever he reached. It turns out that the man performing the trick was the retired magician, T. Nelson Downs, known in his day as “The King of Koins”. As Ben narrates the story he reproduced what downs did, thus giving the act a personal rather than an historical context. The three most memorable illusions are those where Ben is silent and performs solely to music. One of these his version of the Chinese rings, performed so slowly and gracefully that it becomes all the more impressive. The second is the lovely effect when he transforms a delicate origami butterfly into a torrent of confetti. The third illusion that concludes the show is his stunning levitation and invisible control of a silver ball. Many magicians perform this illusion in a large theatre, but to see it from only ten or twenty feet away makes it truly mind-boggling. You simply can’t believe that what you was seeing can really be happening right before your eyes. The illusion left adults and children agape in wonder. While Hocus Pocus follows the set design of The Conjuror Suite in draping the entire back wall in a elegantly embroidered cloth with only a table and two chairs on stage as props, it adds to this two large high definition screens on either side of the stage. Before the show begins, projection designer Cameron Davis uses the two screens to frame print advertisements from the 1920s to ‘60s that somehow reference magic or magicians. Later the screens are used to set up certain scenes such as using Tibetan sand mandalas for the coloured sand trick. They only become obtrusive when they show movement of change images while Ben is performing. From an aesthetic point of view, Ben really should not use the screens at all since they clash with the pre-electronic, pre-digital world of illusion that Ben creates. Most will not see this as a problem and focus entirely on Ben himself. In his fascinating note in the programme, Ben states, “My goal is to engage the mind and the eye with ideas that have the potential to transform; that is, to get each person – young and old – to look at the world in new ways”. That goal, so eloquently expressed, is exactly what Hocus Pocus achieves. You don’t need CGI or high-tech to make the impossible seem possible. Magic as Ben performs it brings the fine art of illusion down to a warmly human scale. Photos: by David Linsell; David Ben producing threaded needles © 2011 Cylla von Tiedemann.